Crumble topped baked pears, simple, but delicious. Sometimes the simplest things can be the most elegant. 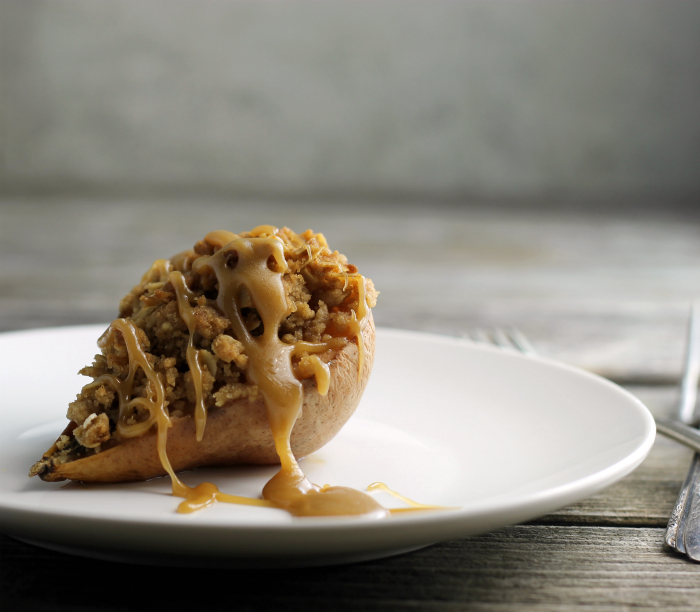 Like these crumble topped baked pears, they are made with a simple crumble and baked until the pears are soft and the crumble is a bit crunchy. A drizzle of caramel and you have a tasty dessert. If you like you can add a scoop of vanilla ice cream or a dollop of sweetened whipped cream. When fall comes around I love all of the apples that are in the stores, but pears are my first love. And when it comes to pears I will always pick the Bosc pear hands down I guess it is all about the flavor of the Bosc pear. 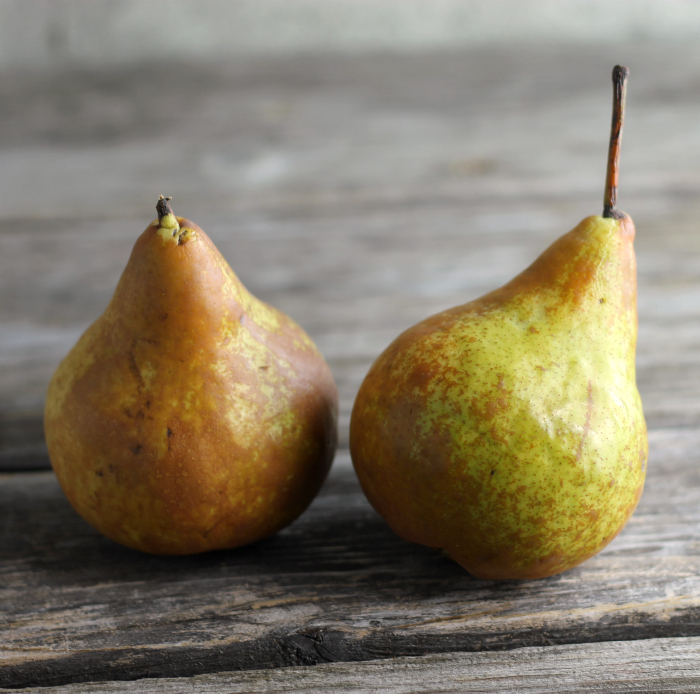 I find that the Bosc pear is sweeter and for me a better flavor than the other pears that I have tasted. These crumble topped baked pears are so simple to make, really no crust to roll out, just to top with a simple crumble and the pears are ready to place in the oven. To make these crumble topped baked pears all you need to do is cut them in half, scoop out the core (I used a melon baller, it worked great) top with the crumble that is made before the pears are cut in half, place them on a baking sheet, and bake them until the pear is soft and the crumble is a bit crunchy. Do you bake with pears? If you said no, you really need to try this. I recommend using Bosc pears. 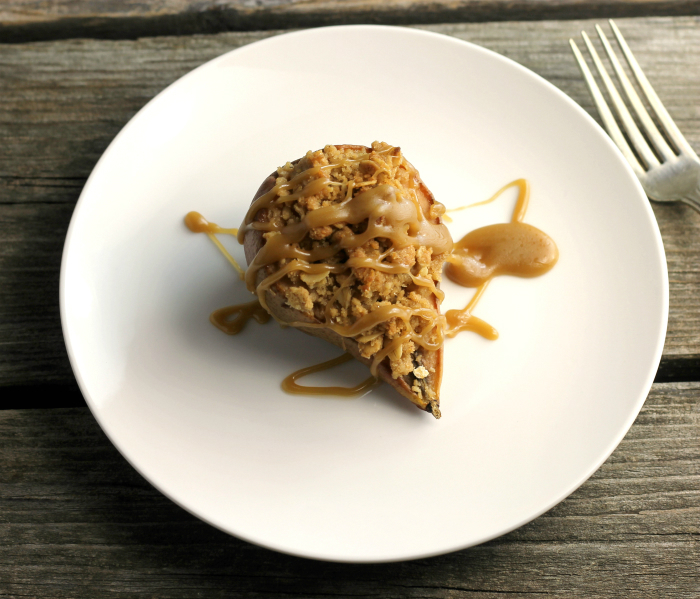 If you like this recipe for crumble topped baked pears you have to check this one, too. For the crumble- mix the flour, oats, brown sugar, and cinnamon together. Add the butter and cut in until well combined and the mixture is crumbly. Set aside. Cut each pear in half. With a melon baller scoop out the core of the pear. Place the pears on the prepared jelly roll pan. Divide the crumble evenly on top of each pear. Press the crumble slightly to the pear. Place the pears into the preheated oven. Bake until the pear is soft when tested by inserting a knife into it, about 20 to 30 minutes. Time will depend on the size of the pears. While the pears are baking prepare the caramel sauce. In a small saucepan add the butter, brown sugar, corn syrup, and whipping cream. Cooking over medium heat bring the mixture to a boil. Reduce the heat and continue to cook for a minute or two, stirring constantly, until the caramel starts to thicken. 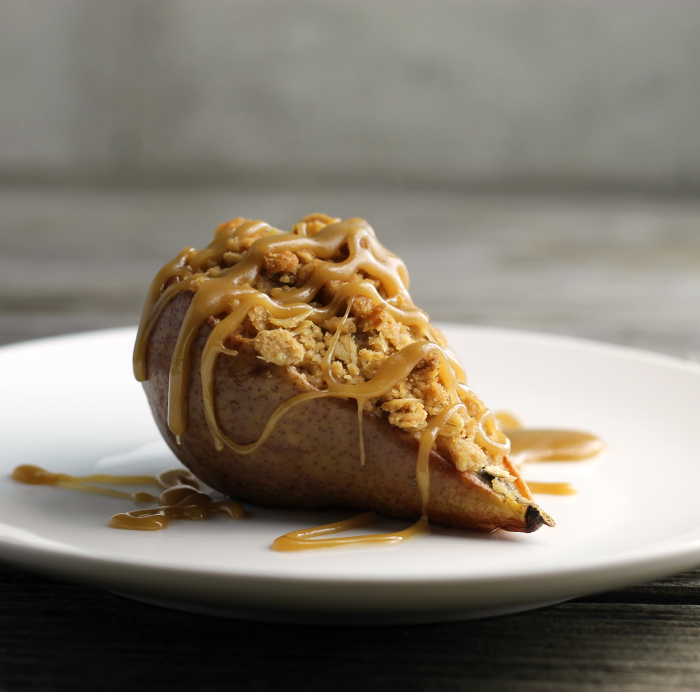 To assemble place the pear onto a plate and drizzle with the caramel sauce. Optional: serve with a scoop of ice cream or a dollop of sweetened whipped cream. Love pears at this time of the year. SO good! And baked pears are the best, particularly with a nice topping like you’ve done. Really good — thanks. Fantastic! That sweet cinnamony crumble is totally irresistible. I just bought a whole ton of pears and apples too! I hardly ever bake with pears but I should. They look so good – love the idea of a scoop of ice cream with them! Makes them extra special.